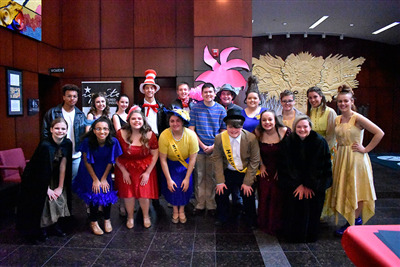 VAN WERT – On Thursday, April 11 the Van Wert High School theatre department will present Seussical the Musical. Seussical the Musical will be performed at the Niswonger Performing Arts Center from April 11-13 at 7 p.m. On Saturday, the cast of the musical held a meet and greet event where Aeris Blakeley, Michaella Johnson, and Dru Johnson encouraged the community to come see the performance for themselves. "Every Seuss book that you've read is probably in this musical," said Michaella who plays Gertrude McFuzz. "It's a mash-up of different stories, and they all connect in one way or another that you're not really expecting." "This is very different from anything we've done," said Blakeley, who plays Mayzie LaBird. "I think it's just all around a family fun show, and it's very catchy so people will definitely be going home singing along to some of the music." Blakeley said that attendants will see many of their favorite Seuss characters in Seussical including Yurtle the Turtle, Horton the Elephant, Sour Kangaroo, the Grinch, the Whos, and more. The performance will be packed full of songs and rhymes. Blakeley, a senior, has done theatre her entire high school career and was encouraged by Michaella to try out her freshman year. "My first musical was Titanic and then from there I've just kept with it because I love the camaraderie with everybody," said Blakeley. "I just love being on stage and being able to be a different person." Michaella is also a senior and has also been in theatre since her freshman year. "When I was really little my parents found out I could sing; they took me to the Civic Theatre, and I always enjoyed that," said Michaella who said she was in a production of Willy Wonka. "Since then, my love for it has just grown." Unlike Blakely and Michaella, Seussical the Musical is Dru's first high school theatre performance. Dru is currently a sophomore and despite never having done theatre before, he landed the lead role as the Cat in the Hat. "I didn't care if I was a main character; I just wanted to do this with my sister," said Dru. "It's her final year so I thought, 'let's do it; let's try it out.'" Dru said that playing the Cat in the Hat is a perfect fit for him because the Cat has a goofy personality that Dru said he relates to. He said he plans to continue doing theatre even after Michaella graduates because he has had a lot of fun. "People underestimate how much fun and how much work it is," said Dru who hopes to break stereotypes as an athlete who is also in theatre. The cast began to prepare for Seussical during the first week on January, and they work up until the performances to make sure everything goes smoothly. Tickets are on sale now through the Niswonger Performing Arts Center Box Office. Stop by from 10 a.m. to 5 p.m. or call 419-238-NPAC. Reserved seats in the Orchestra Center section are available for $10 each. General Admission tickets are $8 each. "A lot of shows you might not be able to bring young kids to, but this show is extremely colorful and they will recognize characters," said Michaella. "This is an awesome opportunity to get kids to want to read a book and be excited because they will recognize the characters."